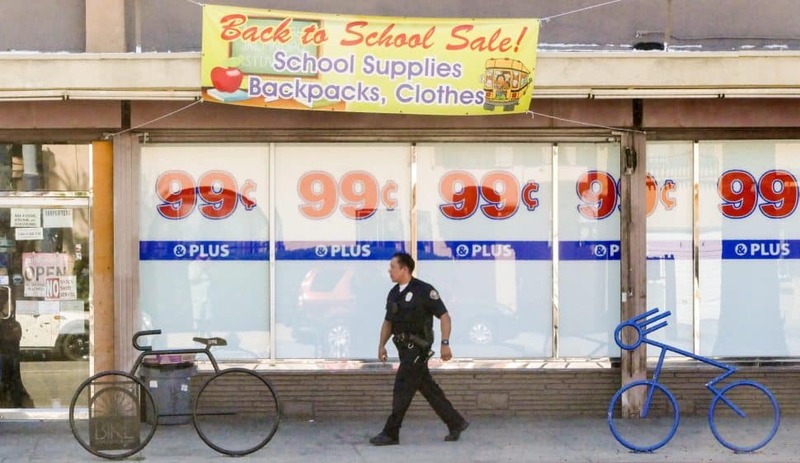 A Long Beach police officer looks for evidence at the scene of a shooting on Pacific Avenue near Ninth Street on the afternoon of Wednesday, Aug. 29, 2018. File photo by Thomas R. Cordova. Long Beach police say they’re using an old tool in a new way in an attempt to deter gang crime in the city. Since last year, the department has put a renewed focus on gathering evidence that could show that acts of gang violence qualify as hate crimes as well, which would mean harsher penalties for the perpetrators. “Our department is aggressively pursuing hate-crime prosecution of gang members when possible,” Deputy Chief Richard Conant said last year as he introduced the idea to the City Council’s public safety committee. Historically, when detectives investigated a gang shooting or other attack, they’ve focused on the shooting itself instead of looking at the words leading up to it, Conant said. But those words can be important—sometimes showing an explicit bias that can lead to more time behind bars under hate-crime statutes. 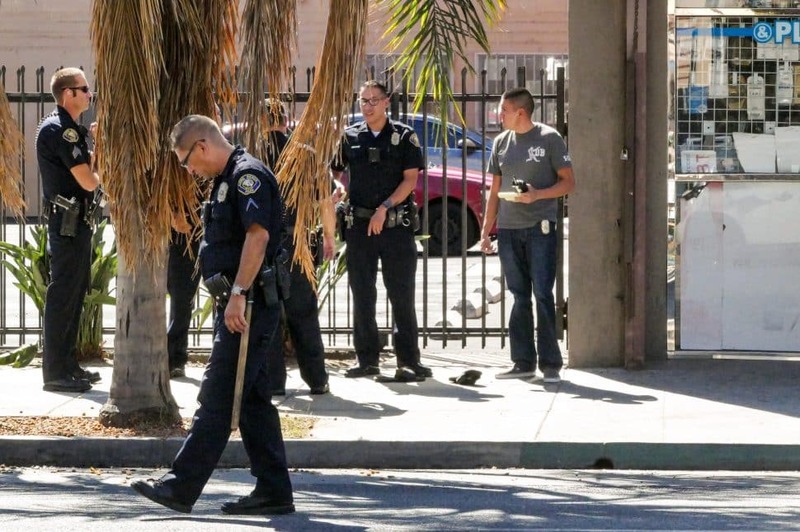 Long Beach police officers and gang detectives looks for evidence at the scene of a shooting on Pacific Avenue near Ninth Street on the afternoon of Wednesday, Aug. 29, 2018. File photo by Thomas R. Cordova. Police pointed to a case from April last year when a teenage boy was walking along the beach when an 18-year-old and three other teenagers confronted him. They asked where the boy was from—a common gang challenge—and then started yelling racial epithets. When a man tried to intervene, the group spit on him and stabbed him several times, according to authorities. A bystander called police, and two months later, the 18-year-old, Andrew Pina, pleaded no contest to assault likely to produce great bodily injury, a crime that normally carries a maximum penalty of four years. But because of the racial slurs and gang challenge, prosecutors were able to tack on what are known as sentencing enhancements to Pina’s charges. Those enhancements—one for the gang element and a second alleging the attack was a hate crime—helped boost Pina’s sentence to nine years in prison, according to court records. “Hate crimes and gang enhancements themselves have been around for some time, but it’s a tool that we discussed last year as part of our overall approach to fighting gang crimes in the city,” LBPD Commander Robert Smith said in an interview last month. But pursuing gang and hate-crime enhancements in the same case could lead to some tricky questions about the defendant’s motive in court, according to Garrick Byers, a longtime defense attorney and past president of the California Public Defenders Association. “Many gangs have a strong racial or ethnic component to their membership; some are even formed based on racial or ethnic identity,” Byers said. If rival gang members of different races attack each other, how do you parse whether the violence was because of gang membership, racial bias or both? “Hate crimes can be very difficult to pin down unless there’s some really strong objective evidence,” he said. Since the beginning of 2017, two people have been convicted of hate-crime enhancements in Long Beach gang cases, according to police. Detectives are also working two more cases that they think could end up in dual hate-crime and gang-crime enhancements. This is a boost from previous years. Between 2014 and 2016, police investigated only one crime that they believe fit into both categories. Smith said these are admittedly small numbers, but he sees the new strategy as a deterrent to gangsters who may otherwise target victims based on their race, religion, sexual orientation, disability or any other characteristic protected by hate-crime law. As with all cases, the decision of whether to charge a suspect with a gang- or hate-crime enhancement will ultimately be up to prosecutors, not police, but it’s important for detectives to recognize the elements that could add up to a hate crime as they’re investigating, according to the LBPD. At the beginning of this year, the department had a training session focused on drawing out evidence that could point to a hate crime. The Anti-Defamation League told investigators they must know what questions to ask and how to ask them sensitively, LBPD Det. Chris Zamora said. “If those questions aren’t asked, many times they’re not brought forward. Was there a racial slur during this crime? To know how to ask that question in a manner that keeps the victim’s own feelings in perspective is important,” Zamora said.